Dandelions set up a booth for the Emerald Executive Association Trade Show highlighting some of our new products, beautiful tropical flowers, and Pink Ribbon Collection. We gave away anthuriums and sampled our very delicious smelling Naked Bee lotion. The trade show had a Western theme (hence the cowboy hats) and everyone had a great time. The anthuriums were a hit! 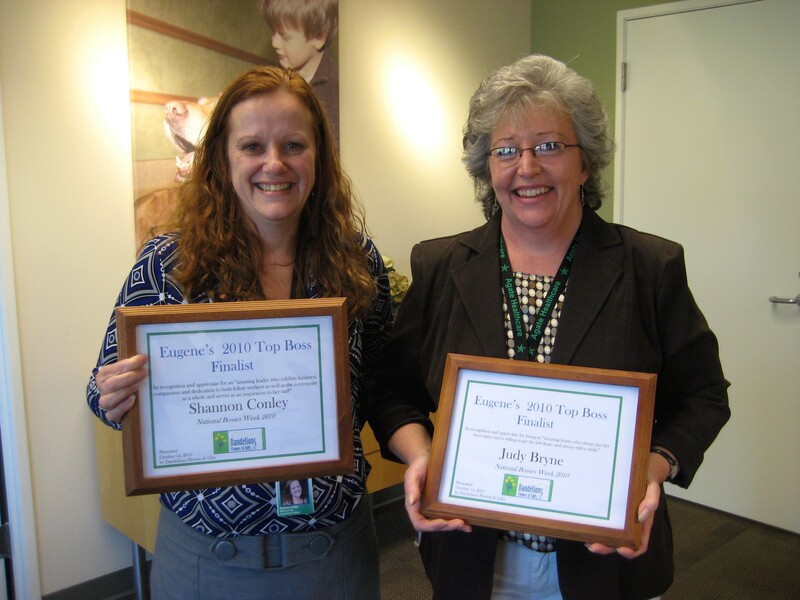 Our 2nd Annual Eugene’s Best Boss contest brought in lots of entries! Thank you to everyone who nominated their boss…there were so many deserving nominees! 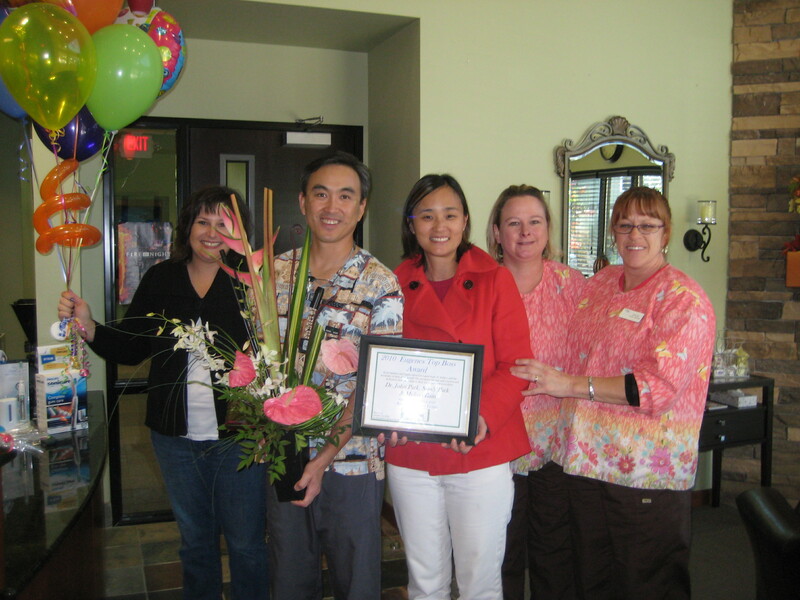 2010 Winners Dr. Park, Sandy Park, Melissa Bain (not pictured) and their nominating staff! In addition, top finalist honors were also gifted to Shannon Conley & Judy Byrne of Agate Health Care and Larry Sullivan of the Eugene School District 4J. Congratulations to all of our 2010 Winners and thank you for making your work environments such a wonderful place to be. It is evident that your employees truly love their jobs and the atmosphere that you create for them! One of the really cool new green flowers that is coming on the market is the “Green Trick” Carnation. I saw these at the Society of American Florists New Varieties competition in Phoenix last year and we also carried some here at Dandelions just this past week. They are wonderful if you like fun bold designs and a unique look. Everyone will say “what is that?” It does not look like a typical carnation at all. This flower is definitely the hot flower for the season!! Green Trick has an exceptionally long vase life of 2 to 4 weeks and is extremely versatile. A favorite for weddings, modern arrangements and bouquets, corporate and event work. The availability of the Green Trick Carnation is best in Spring and Summer and slightly limited in Autumn and Winter. Take a look at this fun new flower!!! It’s not your grandmas flower anymore! We are proud at Dandelions Flowers to have been awarded the National 2010 Floral Outstanding Marketing & Promotions Award, presented by Florist Review magazine and the Whoelsale Florist & Forist Supplier Association (WF&FSA). 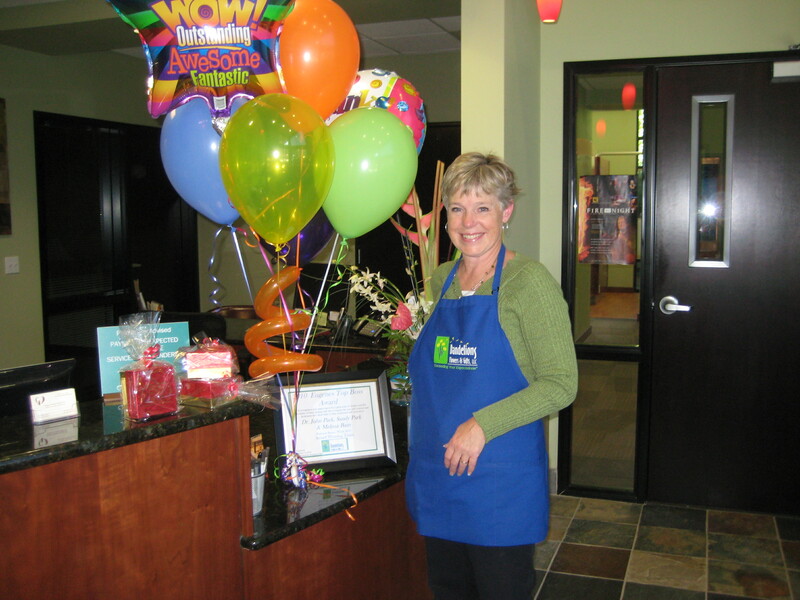 This annual award is a part of the National Retail Florist of the Year contest, of which we were runnerup in 2010. It was a great honor to have been nominated and then a true surprise to have been awarded this prestigous award. Pardon our bragging, but thought you may like to know! We always strive to keep our customers abreast of the beauty and emotional power of flowers, and enjoy keeping up on the new technology and web applications that make this possible.